This prominent vantage point and strategic site was quickly recognised by the Normans, who built a huge timber fortress here by 1100 AD. Originally built by Robert de Toeni, (later known as Robert of Stafford), in the Norman period, Stafford Castle has dominated the local skyline for over 900 years. In the years shortly after the Norman invasion of 1066, William the Conqueror is believed to have ordered defences to be built against a still hostile and rebellious native community. The fortunes of the castle and its owners, the Stafford family, fluctuated greatly. An impressive example of the motte and bailey system, Stafford Castle enjoyed mixed fortunes throughout the medieval period. In the 14th century Ralph, a founder member of the Order of the Garter, became the1st Earl of Stafford. He ordered the building of a stone keep on top of the motte in 1347 and the following year was granted a licence to crenellate and so constructed the battlements. In 1444 Humphrey Stafford was created Duke of Buckingham and the castle entered its heyday. By the early 17th century however the condition of the castle had deteriorated and during the English Civil War the Parliamentary Committee in Stafford ordered it to be demolished. By the early 17th century, the castle's fortunes waned. During the early part of the Civil War it was defended by the Gallant Lady Isabel but was eventually abandoned and demolished. Extensively rebuilt in the Gothic Revival Style in 1813, the castle fell into ruin through this century. Rebuilt by the Jerningham family in the early 19th Century using the same foundations the keep was again a magnificent four storey structure. However, given over to caretakers and then abandoned again in the 1950s it became derelict once more. Now after recent restoration work and a programme of archaeological investigation Stafford Castle is considered one of the best surviving examples of Norman earthworks in the country. A programme of archaeological excavations has gradually revealed many of its secrets. Visitors can follow an informative trail of interpretation panels to discover the castle's history. Today, the remains of the castle, together with the surrounding grounds, give visitors a fascinating insight to the 900 year history of this important site. An inventory taken in 1537 shows how herbs were an important part of daily life at Stafford Castle. They were widely used for their medicinal, aromatic and edible properties. From this detailed inventory, a herb garden was planted in the castle grounds. Great faith was placed in the use of herbs and they still have an important role to play today. This garden has been designed with sixteen beds, each containing herbs related to specific illnesses. As well as being extremely enjoyable to walk around, the herb garden provides a unique insight into living history. The site itself extends to over 26 acres and consists of Keep, inner bailey, outer bailey, woodland, herb garden, visitor centre and car park. The Keep is open to the public during Visitor Centre opening hours. The Visitor Centre has an audio visual display which tells the history of the castle; hands on items including arms, armour and costumes; a timeline to put the history of the castle into a national context; a display area with a changing programme of exhibitions and exhibits; and the opportunity to try your hand at coin minting and brass rubbing. The Visitor Centre shop offers a wide range of gifts, souvenirs traditional toys and local crafts and we stock a large number of local history books. Also on sale are ice creams, chocolates and soft drinks. Outside the centre visit the fragrant herb garden and discover what herbs were used for in the medieval period. A full and exciting events programme includes the annual Stafford Festival Shakespeare production each summer. There is a school and group tour programme and occasional themed tours, talks and workshops. Stafford Castle is located on Newport Road, Stafford, ST16 1DJ. Click the marker and then the 'directions' link to find your way there. The Centre brings Stafford Castle to life. The interior is designed to encourage a 'hands-on' approach to history; the emphasis is most definitely on information with fun. A collection of artefacts from archaeological excavations is on display and guides are pleased to answer your questions on the castle and its site. There is an audio-visual area with film narrated by Robert Hardy explaining the history of the castle. The layout is in the style of a Norman guard house. A scale model of the motte and bailey castle shows what it may have looked like in 1100 AD. The Castle Shop has a wide range of souvenirs to suit all pockets. It features a range of children's books on castles. Throughout the year, Stafford Castle host a diverse programme of events ranging from historical occasions to family fun days. Since 1991, the castle has acted as a backdrop for performances of Shakespeare's plays. There is disabled access to the visitor centre. Toilet facilities (RADAR). 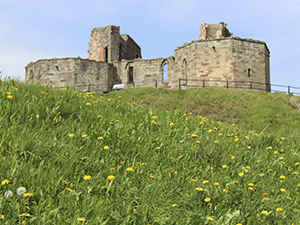 School visits to Stafford Castle are designed to be cross curricular and while there is an emphasis on History; our tours incorporate the study of Maths, English, Geography, Design and Technology, and Citizenship. Hands on activities and role-play are also designed to encourage and stimulate team building, drama, art, and language skills. For more information about the school tours that are available at Stafford Castle please see our Heritage School Tours page. Children's Birthday Parties can be booked at Stafford Castle and usually take place on the weekends. Children can dress up or try on our dressing up clothes including Knight's tabards and girl's medieval dresses. The parties will include a short walk around the site (weather permitting), a treasure hunt and there will also be a Knighting Ceremony for the birthday child! The Visitor Centre is wheelchair accessible and there is a disabled toilet on site. Access to the grounds and the Keep is extremely difficult for people with severe mobility impairment. However, guides are always willing to give any assistance possible. Please phone 01785 257698 for more information. It may be necessary during periods of storm weather to close the Stafford Castle Site due to high wind levels. For further information in the event of site closure telephone 01785 257698.